Bertie Bradshaw cannot remember a time before bomb raids or food ration cards. Bertie volunteers to become a civil defense officer as a way to help his country during WWII, but also to distract himself from the fact that his family is split apart and it is all his fault. On his first night on the job, Bertie runs into Eleanor, who drops a small red notebook as she seeks shelter from the bombs. Inside the notebook are journal entries about a young woman who has been trained to be a spy for the allied troops and writes in code details about her mission. Bertie then wonders if Eleanor is the spy mentioned in the notebook or the disappearing woman he met. He cannot be too quick to trust because the Invasion (D-Day) is coming and it is crucial that the Germans do not learn when and where it will happen. I found this historical novel engaging because it focuses on different historical elements of WWII. 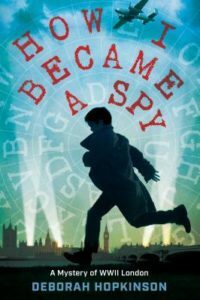 Before reading this story, I did not know about the spy organization located in England on 64 Baker Street. I found it amusing knowing that the spy agents were known as the Baker Street Irregulars, a reference to the famous fictional detective Sherlock Holmes. The events in the story feel realistic and it was interesting learning about some common ciphers. I would highly recommend this book to anyone who enjoys learning about WWII, historical novels, adventure, and mystery. An advance reader’s copy was provided by the publisher.